Our trained photo technicians correct for color and density to create the most desirable photos from your 35mm or advantix(220mm) film, ready for you in an hour (based on volume). Photos are printed on matte or glossy finish as 4x6 or 3½x5. Every roll comes with a free index print which shows small images of each of the prints on the roll along with the negative number. Images can be transfered to CD. We offer standard Reprint Quality CDs, Kodak Picture CDs, and Enlargement Quality CDs. From your CD, you can order photos in our store or from your home computer using our Online Photo Lab. Special Develop-and-Print services are available: bordered prints; color film printed black & white or sepia toned; processing of wet or damaged film. We also offer “develop only” service for color film. Your negatives are processed and sleeved in 4-frame strips, or rolled uncut in a long sleeve. Contact Sheets are also available from your negatives. We are able to create additional copies from your previously processed negatives, slides or digital files. Standard sizes such as 4x6 and 3½x5 as well as enlargements up to 44x96 inches and other sizes. Wallet size prints (approximatley 2½x3½) are die cut with rounded corners for a professional look. We can create smaller prints for use in lockets, ornaments or keychains. Enlargements can be mounted on 3/16” gator-board (black core) or 1/8” matboard to provide a professional look. Other odd sizes may be printed as well. Please contact us with your various needs and we will happily tell you what we are capable of and what we would recommend. Wide format enlargement sizes are made from digital files with print sizes up to 44x96. Negatives, slides, transparencies and prints can be scanned and saved as digital media for a minimal scanning fee and then printed as wide format prints. 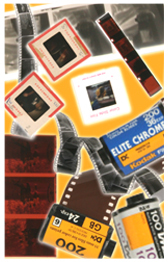 Custom prints can be made from 35mm, APS, 120, 126, 127, 620, 70mm, 35mm half-frame & 4x5 sheet film. Images can have areas dodged or burned to create a professional depiction of your negative or other media. Digital files can be enhanced as well with prices based on an estimate that our digital artists relay to you. Please contact us with any questions or concerns regarding any of our services.